The Hardy borescope is big, rugged, and bright. The thick-walled stainless steel tube has an outside diameter of a quarter inch, and is packed with four times the illumination fibers of the Hawkeye Slim Borescope, allowing three times as much light. It's great for looking into the large, dark cylinders of aircraft, marine, truck, and off-road engines. It lights up the spaces behind walls to inspect for termites. 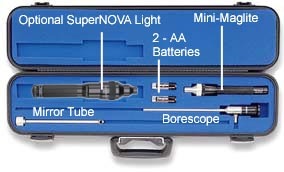 Couple the Hardy Borescope with our high intensity, portable Nova light and they pump out 30 times more light than the Hawkeye Slim with the standard Mini-Maglite®! 0° direction-of-view and 45° field-of-view. 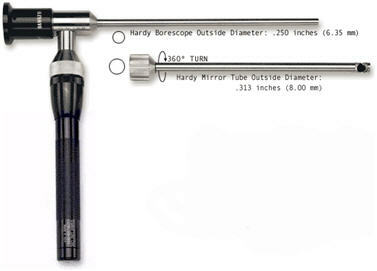 A rotating 90° direction-of-view is achieved by sliding a Hardy Mirror Tube onto the scope.